What Day Of The Week Is October 14? 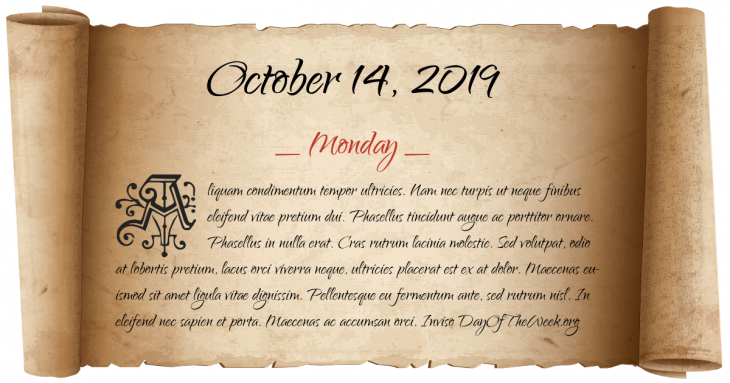 October 14, 2019 is the 287th day of the year 2019 in the Gregorian calendar. There are 78 days remaining until the end of the year. The day of the week is Monday. The first recorded Ministry of Education, the Komisja Edukacji Narodowej (Polish for Commission of National Education), is formed in the Polish–Lithuanian Commonwealth. While campaigning in Milwaukee, Wisconsin, the former President of the United States, Theodore Roosevelt, is shot and mildly wounded by John Schrank, a mentally-disturbed saloon keeper. With the fresh wound in his chest, and the bullet still within it, Mr. Roosevelt still carries out his scheduled public speech. The Vietnam War: The folk singer Joan Baez is arrested concerning a physical blockade of the U.S. Army’s induction center in Oakland, California. Who were born on October 14?